Los Angeles may be one of the most dog-friendly cities in America. Whether it’s a dog bowl outside every door down Montana Avenue in Santa Monica or hotels offering dog beds and chew toys for their puppy patrons, there is no shortage of dog friendly destinations to bring your furry friends. In our first edition of Top Furriendly Spots in LA, we are going to take you to our favorite spots on the Westside, ranging from brunch spots, to hotels, to coffee shops to get some fresh air with your pupper pal. Coral Tree in Brentwood has a huge patio wrapped around the entire length of the restaurant. To be honest, there might even be more outdoor seating than indoor. They also have heat lamps and nearly every table on the rare night it gets cold in LA. We recommend the Avocado Toast or Kale Salad. Oh, and Happy Hour is until 7PM and offers $5 glasses of wine while your pooch can lounge at your feet. Ashland Hill on Main Street in Santa Monica almost has no choice but to be dog friendly, nearly all their seating is outdoors! They have a lovely, spacious covered patio in back and offer not only water bowls but a complimentary treat upon arrival and a whole pup-friendly menu called the “Yappy Menu” including Chicken & Woofles and Chocolito’s Ice Cream. They also have Yappy Hours the first Tuesday of every month! Serving: Breakfast, lunch and dinner. Please note the restaurant is closed from 2:30PM-5:30PM between lunch and dinner service but the cafe remains open until 5PM. Rose Cafe is fabulous for humans and dogs alike! They have two vast patios, one on the parking lot side and one by the front entrance. The one by the parking lot if a little quieter if you have a but of a more nervous pup but both are heated. As for the food, we highly recommend ordering their off-menu Cacio e Pepe Spaghetti. It might be the best pasta in the city, but that’s just our humble opinion… you can thank us later! Need an hour of pampering to yourself but still want your pupper by your side? Drybar’s got your back, with a bowl of water too! 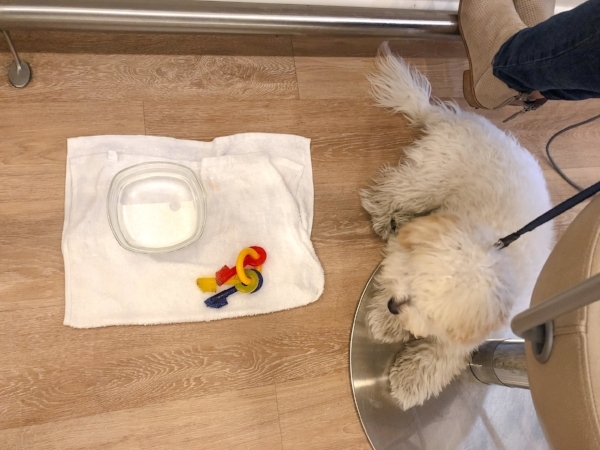 Most of the stylists at Drybar are huge animal lovers including the current manager who will come by with a bowl of water to hydrate your pooch without even having to ask. Also, if you need some retail therapy after your fabulous blowout, head next door to William B for some great shopping and a treat for your pup! We wanted to give a huge shout out to The Intercontinental Century City. With the recent devastating wildfires affecting LA and surrounding areas, many people had to evacuate their homes and find shelter elsewhere, some with their furry friends in tow. The Intercontinental opened their doors with with open arms being as welcoming to humans as they were to pets. Dog beds and bowls were provided for every animal and all restaurants on the premises were also dog friendly, big or small. The staff were not only accommodating, but happy to help anyone with their needs, including playing with the pups! Royal treatment at DryBar Brentwood! These are just a few of our favorite dog-friendly Westside spots. Let us know yours below because we are always looking for the newest and greatest spot to hang with our best friends!